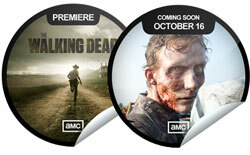 The hotly anticipated return of AMC’s “Walking Dead” TV series this week not only won in the traditional ratings but also scored a record high in mobile entertainment check-in service GetGlue. Entertainment fans and members of the social network check-in to share what they are watching or reading. For the evening of its premiere, Oct. 16, "Walking Dead" generated 42,930, the highest single-evening total for a show GetGlue has ever recorded. The social network reports that 20,000 of these members checked in during the first 20 minutes of the show. Through the week, “Walking Dead" accrued 67,449 check-ins. The social buzz for the show on GetGlue has increased exponentially since its previous season. The sixth and final episode of the show that aired last December had 6,252 check-ins. "Big Bang Theory." According to the company’s weekly chart of most popular shows on the network, the CBS nerd comedy had 81,973 check-ins for the week of Oct. 10-16. AMC’s hit series took the number two spot, but the new FX cable series “American Horror Story” was third, trailing by a large margin with 33,672 check-ins. In addition to sharing comments about their tastes on GetGlue, members also gain badges for their loyalty to certain brands. The cable and small networks actually fare better in the GetGlue charts, as the social connectivity of the service maps best against series with strong fan bases and cult followings. Shows such as “Dexter,” “Vampire Diaries” and “Supernatural” tend to chart well. While CBS’ “Big Bang” sitcom may lead the chart, Fox’s “Fringe,” (28,205 check-ins), NBC’s “Community” (20,485 check-ins) and ABC’s “Modern Family” (20,251) are the only other major network shows in the mix.